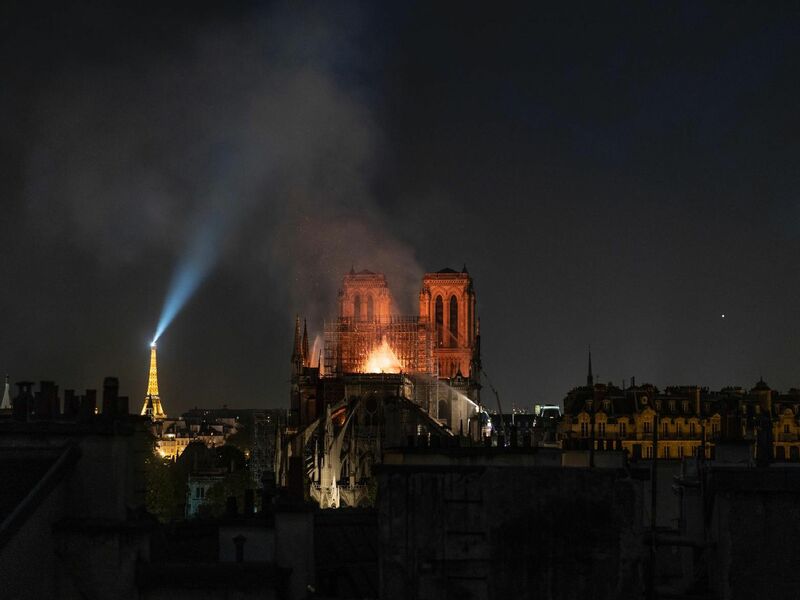 A huge fire swept through the roof of the famed Notre-Dame Cathedral in central Paris last night, sending flames and huge clouds of grey smoke billowing into the sky. It took firefighters hours to control the blaze. which resulted in the collapse of the famous spire to collapse. The cause is unknown but officials have said it was possibly linked to ongoing renovation work. Smoke billows as flames burn through the roof of the Notre-Dame de Paris Cathedral. An image taken from a television screen shows an aerial view of the Notre-Dame Cathedral engulfed in flames on April 15. The fire broke out on Monday afternoon and quickly spread across the building, collapsing the spire. The cause is yet unknown but officials said it was possibly linked to ongoing renovation work. Images posted on social media showed flames and huge clouds of smoke billowing above the roof of the Gothic cathedral, the most visited historic monument in Europe.